Where do I start? I have lost 52 kilos with MiracuLoss. I never ever thought I could do this, I have tried everything. I was big as a child and thought I needed to stay that way. There are so many health benefits and I do not snore anymore!! My ankle was very sore and prevented me from walking some days and now it’s fine. I could not walk up the stairs in my home without a lot of puffing and now I find myself running up and down them. I am less cranky with my children and I even got into swimming gear and went down the slide with my child for the first time. I now qualify for health insurance which I could not get before. People tell me I smile more often. I just simply feel so well and I cannot believe I was as big as I was, I did not realise it. It has taken me from January to January to lose 52 kilos with several breaks in between the weight loss. I have really enjoyed the food and the simplicity of my life around food whilst on MiracuLoss. The meetings have been so useful too. I could never have achieved this without the support and guidance of the MiracuLoss team. When I started the programme I was a size 26. I’m now a size 12 and still keeping the weight off, not like all my other diets! 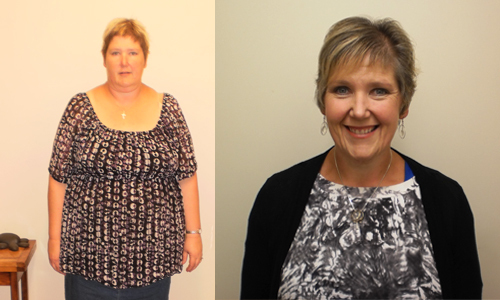 We’re pleased to have received so much positive feedback from clients who have lost weight and kept it off in a safe, healthy way. 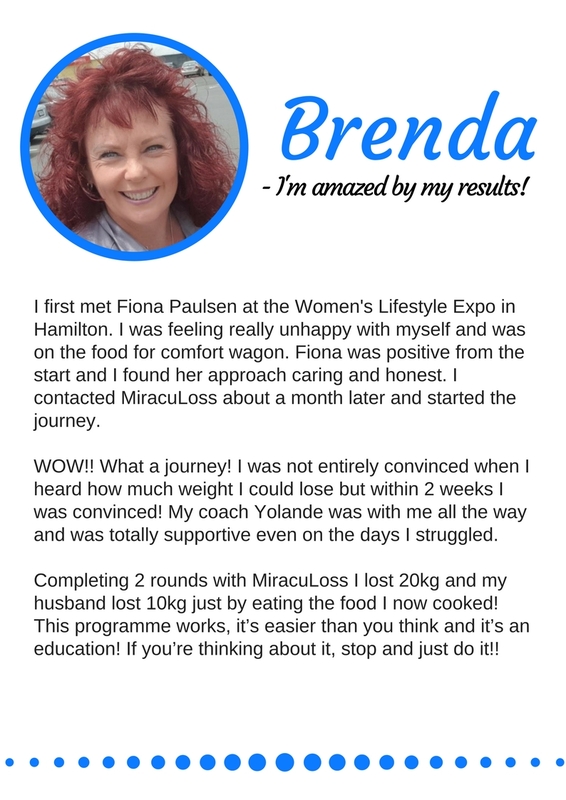 Read on to see what some of them have to say about the MiracuLoss weight loss plan. Truly a life changing experience! I am now educated in choosing the healthy options that work for my body, with ongoing support from a group of people dedicated to helping one another live a better life. The beauty of it is that there are no ongoing financial commitments. After years of trying to lose weight and gaining more than I was losing, I was introduced to MiracuLoss. I decided to attend the meetings and get with the programme. I was excited by how easily the weight fell off. Yes, I had days when I had lost nothing and other days when success was forthcoming – but with the help of my mentor and a really healthy eating programme, I never went off track and for the first time in my life, I understood how the body retains fat cells, and how to get rid of them for good. My family and workmates couldn’t believe how great I was looking and how quickly my body was responding to the programme. I have kept the weight off now for the past eight months and am confident that I will continue to do so with the knowledge I have gained on what my body needs to keep healthy and free from toxins. Thank you MiracuLoss, you have changed my life. The coaching was most invaluable, almost integral really. When things are a bit tough, and you’re not too sure of whether to try this or that or even to continue, your coach is there to steer, cajole, and assist with ideas. The weekly meetings are really beneficial. My entire way of looking at food has changed. I’m now far more educated in terms of how to ‘mix’ my foods. I have learned what foods have been affecting me over the years. My dietary choices have changed greatly. And that ‘feel good’ factor cannot be overlooked at all. I feel better psychologically; I’m in a good headspace and feeling great with a positive sense of achievement. I’m also sleeping a lot better. All up, I’ve lost over 16 kilos! I’m so over the moon! Nine months have seen me lose 32 kilos without ever feeling hungry. I have gone from a size 20 to a size 10 – it’s my gift to me to feel fantastic at 40. The coaches were so supportive with our daily talks through the weight loss and maintenance stages. My personal coach also set me up with nutritional information about what foods work for me, so I know I can keep the weight off for good. I’ve tried everything, but MiracuLoss worked. I’ve never looked or felt better. It seemed too good to be true, but watching my partner lose untold kilos so effortlessly got me hooked. Now I have lost 8kg and 16 cm from around my waist in three weeks, and I can wear all the clothes in my wardrobe! My confidence has grown hugely and I feel so much happier. I walk up 11 flights of stairs to my apartment which there was no chance of me doing before. I am doing physical things that I would not have done before because of my size. I have a whole new wardrobe of styles that I never imagined being able to wear. I have tried every diet for all of my adult life. I used to drink diet coke daily and was irritable most of the time. I now feel happy and well and eat lots of delicious food. When I was dieting on a previous occasion I lost 20 kilo’s and still could not feel my hip bones, and then I regained all that weight. After just 8 kilos on MiracuLoss I could feel them for the first time ever! MiracuLoss really is a different approach with a different result. I have achieved my goal of loosing 40 kilo’s and am just right for my height /weight ratio. This is truly my last weight loss effort. I did not really believe my coach when she said that it would be, but I am maintaining easily on all food types. I went to all of the meetings which were invaluable and learnt things that I did not know even after all my knowledge about ‘diets’! Thank you for the rest of my life. I have lost 35 kilo’s so far and now I know I will definitely lose the rest. The biggest thing for me was the big boost in my confidence. I was not accepting social invitations and when I did I was placed at the end of the table as I could not fit easily along the sides. I now have the energy, mobility and speed that I had 20 years ago and I can run again! Before starting MiracuLoss I could not easily get in and out of the car which is part of my job. Now it is so easy! My cholesterol levels have decreased, my sinus issue has completely gone and my sleep is much better. My joints are less achy especially my knees and ankles which were always sore. My shirt size has gone from a 6XL to a 2XL. I think I have added years to my life and will get to meet my grandchildren. I have got my life back. The comments from others are brilliant and have helped me feel great about myself. I can’t thank MiracuLoss enough for what they have done. What I have most appreciated is how well it worked! The HGC was a bit of a miracle to help me do what I have wanted to do for 30 years! That and the coach – the regular support was key to me keeping on track! Also – how being helped to stay on track with the weight loss phase allowed me to see my triggers, automatic behaviors, etc around food so well! Health – wow- well, I have been reviled of some long term aches and pains, I can walk up hills now – a lot of good! Dropping 20kgs has been amazing. My skin is still a little dry, but other wise it has been a health improvement all around. The coaching was great! The regular texting worked brilliantly for me. The way the program was laid out, the time leading up to actually choosing to do the program, it was well managed all the way through. I liked the way I was given so much info, that you waited till I was ready, then explained things well at each stage – all good. I came to MiracuLoss because of my wife, she was having an operation for cancer and wanted to lose some weight and I wanted to support her with that. I work in the entertainment industry, which can be an office job most of the time. My eating habits in the past were not the greatest and there are heaps of restaurants and takeaway shops where I work. I was worried about how I would go because it seemed pretty strict to me but I was pleasantly surprised as it wasn’t as hard as I thought it would be. I started in August last year and by March I’d lost about 40 kilos which I’m maintaining easily. My coach was really helpful – keeping both of us on track with her encouragement and advice and reminding us what we need to be doing.I now eat more of the right foods for my body and I avoid bread and other similar starches. I love vegetables, meat and fish and I keep processed meats such as sausages to a minimum where previously I ate a lot of them. I’m also incorporating other good foods such as seaweed into my diet. I’m planning on another round in Spring to get back to the weight I was in my younger days which I now realise it totally achievable. My results so far still seem surprising to me and I’m looking forward to dropping another 8 kilos before Summer!